Writing entertaining blogs, or blogging entertaining writings (whichever you prefer), with a dash of inspiration or a hint of criticism requires a great deal of creativity, a high level of perseverance and bags of quick wit. We were well aware of that when we decided to start posting blogs several months ago. So we were all geared up and in cold sweat, frantically determined to live up to that promise, when providence decided to intervene and, in a way, lend us a helping hand. As you may recall, we were in the middle of preparing our previous blog when our writing process was – both unexpectedly and favorably – interrupted by the publication of the most recent UEM Smackdown. In the case of our present blog, a significant development in South Africa claims priority. Our Leeds-based partner Software2, which holds strong positions with universities around the globe, recently blew us away with the news that they have persuaded Stellenbosch University near Cape Town to implement Scense workspace management. Thus providing us with an absolute first on the African continent and filling us with a pride that even a peacock (African or European, your call!) would be jealous of! 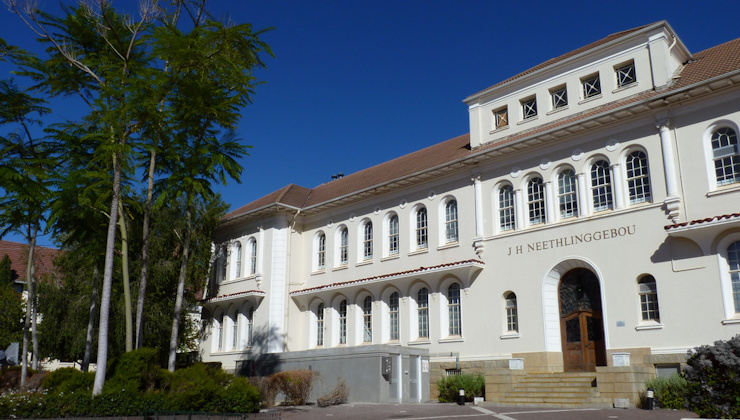 Stellenbosch University (SU) is a highly respected and renowned South African university, with a history that dates as far back as the 17th century. SU is home to an academic community of 29,000 students from 100 countries as well as 3,000 permanent staff members on five campuses. The main campus in the picturesque university town of Stellenbosch in the heart of the Western Cape vineyards is quite an attraction for students. Privileged as they are with such an abundant ‘working environment’, students cannot settle for less in terms of their more immediate working environment. A system of Virtual Desktop Infrastructure (VDI) was introduced, allowing for BYOD. BYOD at Stellenbosch delivers 700 virtual Windows desktops to Windows, Apple, Android and Linux devices. Until recently, virtualization at SU was carried out using different components from a range of workspace management suppliers. From now on, however, Scense will take virtualization to the next level with its proven, integrated approach. In doing so, Stellenbosch will be future-proof for quite some time to come. On a different note, we still owe you the blogs we initially planned to post. It won’t be long before we live up to that commitment. After all, we cannot always be this lucky. Or can we? Would you like to know more about VDI, Workspace Management or other Scense solutions?